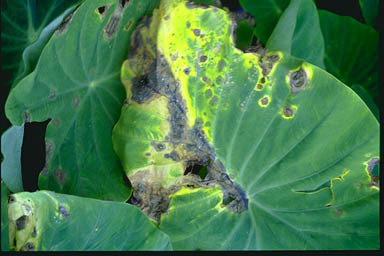 Phytophthora leaf blight (Phytophthora colocasiae) is a fungal pathogen. It is a native of Hawaii and was first detected in Hawaii in 2010. Phytophthora colocasiae is known to infect taro, dasheen and some cultivars of ape or tamu. The early stage of leaf blights are characterized by the formation of small, frequently circular brown to olive-green spots.